Open water visible off the coast of Nome, Alaska on April 5 2019. Every year in the western Alaskan town of Nome, as mushers and their dog teams cross the finish line during what’s locally known as “Iditarod week”, golfers take part in the annual Bering Sea Ice Golf Classic. The tournament takes place on the expanse of shore ice that usually extends miles off the town’s banks over the Bering sea. This year, however, it was plagued by a hazard that seeped through areas of the course: open water. It wasn’t exactly a new problem, either. 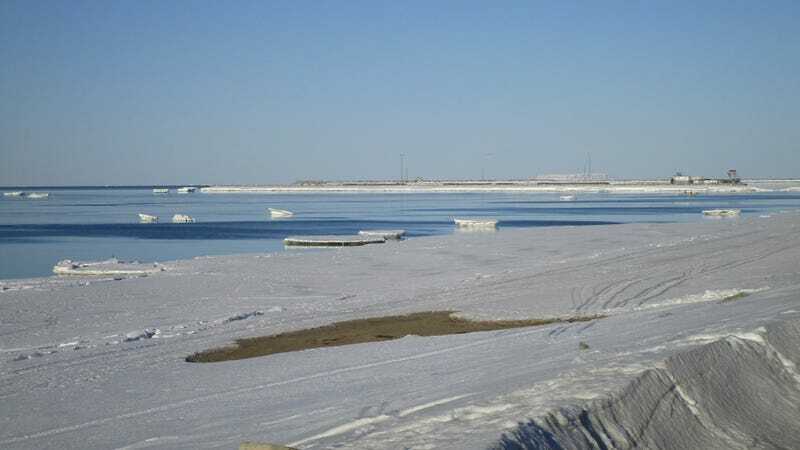 Nome residents had experienced a winter nearly as watery just a year before, disrupting everything from golfing tournaments to subsistence crabbing. Now, it’s looking like a worrying new normal. If the world is baking slowly, the Arctic is being microwaved on high—heating twice as fast as the rest of the planet, according to the National Oceanic and Atmospheric Administration’s 2018 Arctic Report Card. But even by Arctic standards, the conditions that residents of Alaska’s western coastline saw starting two years ago have been pretty unprecedented. Most winters, ice formed in the Arctic’s Chukchi sea spills south, triggering the freeze-over of the northern Bering sea around November. As the ice grows, leftover salt concentrates into a brine, which sinks, forming a dense layer of cold water around -2 degrees Celsius. This so-called cold pool spreads southward with the ice, sheltering king crab and Arctic cod from larger predators such as Pacific cod and pollock—and making it easier for the crab to migrate to shallow water to mate in winter and spring. However, since 1981, the ice-over in the southern Chukchi has occurred more than half a day later each year. Then, in 2017, a persistent southern wind kept ice marooned in Chukchi, before finally warming the Bering. The winter of 2017-2018 boasted the lowest ice extent—which measures ice cover, but not depth—ever seen on the Bering. This year, a series of storms with southerly winds again stripped away the ice. And even though the extent of sea ice has been a bit higher for much of this winter, data on the depth of the ice, which is much harder to measure, likely put the two years in similar territory, Alaska Center for Climate Assessment and Policy climatologist Rick Thoman told Earther. A largely ice-covered Bering sea in April 2014 (left) contrasted with a largely ice-free Bering at the end of March 2019 (right). Under the water, meanwhile, the protective cold pool largely didn’t form. On the shores of Nome, where crabbers would normally be flocking, there was even less ice this year compared with last. “The winter fishing for king crab, around here, is the traditional fishery,” Charlie Lean, the chairman of the Northern Norton Sound Fish and Game Advisory Committee, told Earther. No, not the large ships careening the cold waves that you see on Deadliest Catch. That’s summer crabbing—a higher-catch, higher-capital, offshore affair for commercial ships, said Nome Area Management Biologist James Menard. Winter crabbing in Nome means hopping a snowmobile, and heading far enough out onto the ice shelf, which usually extends over two miles, to reach water at least 20-40 feet deep, said Menard. Armed with ice augers and “huge chainsaws,” crabbers cut holes around 5 by 5 feet. Men push the carved-out ice block beneath the surrounding shelf with pikes, and drop crab pots. “When I was a child, in the ‘50s and ‘60s, the native peoples here in the Bering Strait, all fished for crabs through the ice,” Lean said. Although there are usually a few dozen commercial crabbing operations employing one to two hundred of Nome’s 3,500 residents, the winter season is still dominated by subsistence crabbers—people with other jobs who set a few crab pots to supplement their diet, said Lean and Menard. According to Menard, this became even more popular after the price for crab doubled around 2012. Now, around 100-150 households participate in subsistence crabbing. But, he said, the season is shortening. Once, the season officially started as early as November 15th—though people didn’t usually like to get out onto the ice until Christmas—and closed in May. Now, courtesy of increasingly tardy ice-over, it only lasts from January 15th to the end of April. “They look out, see the open water, and forget it,” he said. Luckily, said Menard, the blow was offset by a good salmon season the last few years. However, the loss of Bering sea ice could threaten other fisheries too, particularly if it impacts spring blooms of algae that grow on the ice and in the water column and form the base of the food chain. That’s not all. Throughout parts of the Bering sea, particularly St. Lawrence Island, climate change seems to be helping drive the replacement of shellfish like bivalves and snails with marine worms. And blooms of toxin-producing algae, which can poison shellfish, are posing a mounting risk for the health of both humans and wildlife, Alaska Department of Fish and Game biologist Lori Quakenbush told Earther. These blooms have already been associated with some wildlife die-offs. This also marks the third year in a row that Alaska has seen massive, mysterious seabird die-offs. The common cause seems to be starvation—which may have been caused by toxic algae, or simply through shifts in Bering biodiversity. Overhead shot of the Bering Sea Ice Golf Classic course, with trees planted in the ice. The one bright spot this year is that the ice has recently started to rebound, said Quakenbush, which is good news for seals who will depend on the ice, starting over the next few weeks, to raise their pups. And at least three species of seals have been successful in chasing the ice northwards, so far. However, said Thoman, the ice regrowth has not taken place everywhere, and in many places where it has, it is likely thin. Moving forward, this may only grow worse. The rise of open water threatens not just wildlife and crabbing, but the Bering Sea Ice Golf Classic, a spectacle with rules you could only ever find on the border of the Arctic Circle. For example: If anyone hits a polar bear, it’s three extra strokes on their scorecard. One hole is located in the “Nome National Forest,” a stand of certified pre-owned Christmas trees planted lovingly in the ice with hammers. Foursomes enroll in the golf tournament for $50. They set green golf balls—about the only kind you can find on ice—atop frontier tees, including shotgun shells and liquor miniatures. The golfers let loose with the highest-quality antique clubs donated by the former proprietors of Nome’s most overstuffed junk closets, targeting old coffee cans. However, after teeing up, the golfers promptly lose their balls, at the top speed of their rusty clubs, in snowdrifts. Halfway through the six holes, participants take a mandatory break at the Polar Bar. According to Menard, the golf course largely held up this year, even as all of the other shore ice around Nome broke apart. “I believe the reason why was it was protected by the harbor jetty,” he wrote in an email to Earther. The longer term outlook, however, seems bleak: “I don’t see much of a future for the Classic on the Bering Sea,” Menard said. The golf tournament may survive on land. However, should open water become the new normal for towns like Nome, it’s unclear exactly how many wildlife will roll with the punches. And the tradition of winter crabbing may become a thing of the past.